Overall the nationwide average shows residential property values increased 6.6% or $41,660 during 2017 from $627,905 in December 2016 to $669,565 in December 2017, according to the latest QV House Price Index statistics. The average national value increased 3.6% over the final three months of 2017. The full set of QV House Price Index statistics for all New Zealand can be found here. Sales volumes were down on 2016 for every month during the year and between February and October they were in excess of 20% below 2016 levels before picking up in November when a post-election late spring surge saw them jump to just 10% lower than November 2016 levels. “Low interest rates, relatively high net migration and lack of supply means market drivers remain and we are likely to see values hold for the most part during 2018 in the main centres but the trend of lower rates of growth is likely to continue." Of the main centres Porirua city, Napier, Hastings and Whanganui saw the greatest percentage growth during the year. The average value across the wider Auckland region increased 0.4% or $4,583 from $1,047,179 at December 2016 to $1,051,762 at December 2017. Values rose 1.2% over the past three months. Annual growth ticked up again across the Auckland region in the final quarter of 2017 with most areas seeing values rising again. 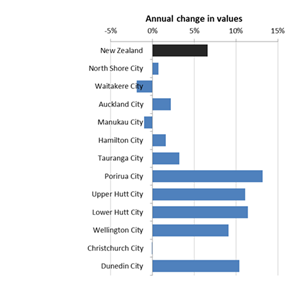 The former Auckland City Council central suburbs saw values rise 2.2% in the year to December and 1.6% over the final quarter of the year with Auckland City - East continuing to rise above average for the region, up 3.6% year on year and 2.8% over the past three months, the average value there is now $1,575,133. Strong value growth also continues for Auckland City – Islands with the Waiheke Island market driving growth up 13.7% in the year to December and 6.6% over the final quarter of the year. North Shore values also ticked up again rising 0.7% in year on year and 2.6% over the final three months of the year. Waitakere values also rose 1.0% over the final three months of 2017 although values were down 1.9% in the year since December 2016. Meanwhile, values are also increasing again in both Rodney and Franklin and particularly in Papakura which rose 2.2% year on year and 2.6% over the final three months of the year. Manukau bucked the general trend as values there dropped 1.0% year on year and 0.3% over the past three months. Values in Hamilton dropped slightly by 0.5% over the past three months but rose on average by 1.6% or $8,586 over the past year from an average of $534,860 in December 2016 to $543,446 in December 2017. Tauranga home values increased 3.2% year on year or $21,528 from an average value of $672,197 in December 2016 to $693,725 in December 2017. After dipping in November, values in the city had begun rising again by December and values rose 1.0% in the final quarter of the year. Meanwhile, the Western Bay of Plenty market has seen sustained growth throughout 2017 and rose 9.1% in the year to December or $52,185 from an average value of $571,520 in December 2016 to $623,705 in December 2017. Values rose 1.4% over the past three months. Values across the wider Wellington Region rose 9.4% or $ 54,040 over the past year from an average value of $574,410 in December 2016 to an average value of $628,450 in December 2017. Values across the region rose 3.6% over the last quarter of 2017. Wellington City increased by 9.1% year on year and 3.3% over the past three months. The average value there is now $756,879. Wellington – North is up the most, increasing by 6.2% over the past three months alone and 11.2% in the year to December 2017. Meanwhile values continue to rise strongly across Wellington’s regional centres. Upper Hutt is up 11.1% year on year and 2.6% over the past three months; while Lower Hutt rose 11.4% year on year and 1.0% over the past quarter; and Porirua rose 13.2% year on year and 3.7% over the past quarter. Finally, the Kapiti Coast is up 13.5% year on year and 3.8% over the past three months. Christchurch city values have remained stable, dropping slightly by 0.1% or $541 over the past year from an average value of $494,247 in December 2016 to $493,706 in December 2017. Values have increased slightly by 0.4% over the past quarter. Meanwhile, growth remains strong across Canterbury’s regions. The Waimakariri District up 1.7% year on year and 1.5% over the past three months; while Selwyn values increased slightly 0.3% year on year and 0.7% over the past quarter. 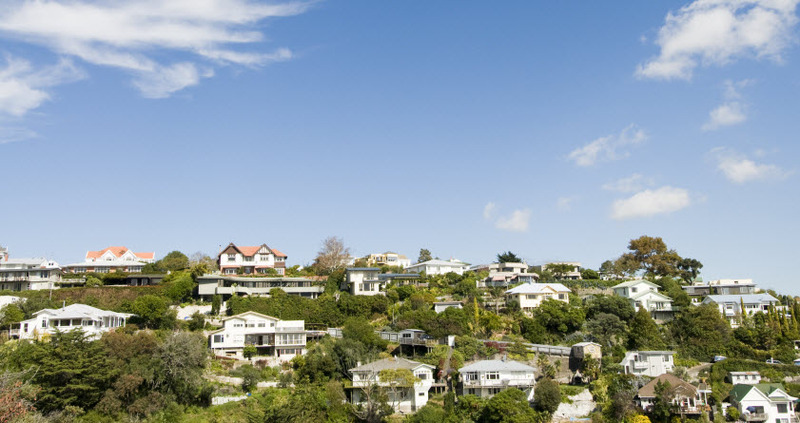 The recent trends continue as residential property values continue to rise across Dunedin. Values rose 10.4% or $36,965 over the past year from an average value of $354,133 in December 2016 to an average value of $391,098 in December 2017. Values increased 2.7% over the final three months of 2017. Of particular interest is the strong growth of the Peninsular and Coastal part of Dunedin, which is up 5.6% over the past three months and 17.9% year on year, followed by the Southern area which increased 5.4% over the last three months of the year and 10.9% year on year. Nelson residential property values continue to increase, rising 11.1% or $55,318 year on year from an average value of $499,866 in December 2016 to $555,184 in December 2017. Values rose 1.8% over the last three months of 2017. Meanwhile, values in the Tasman District have also continued to rise, up 11.4% or $56,927 year on year from an average value of $499,082 in December 2016 to $556,009 in December 2017. They increased 3.0% over the last quarter of 2017. Values continue to rise across the Hawkes Bay region. Napier values rose 15.1% or $62,770 year on year from an average value of $415,189 in December 2016 to an average value of $477,959. Values rose 2.6% over the past three months. The Hastings market also continues to rise up 14.9% or $57,828 year on year from an average value of $387,133 in December 2016 to an average value of $444,961 in December 2017. Values increased 3.0% over the last three months of the year. 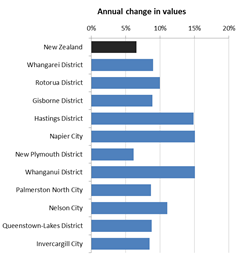 The growth in values across many central and lower North Island provincial areas continues. Values in regions including South Waikato, Opotiki, Rangitikei, Tararua and Carterton have increased particularly over the past three months. Meanwhile, provincial areas to the South and North of Auckland – including the Kaipara, Hauraki and Thames Coromandel District - continue to see values decrease despite the trend of market growth over the past few years. In the South Island regional centres, it’s a relatively stable outlook. Values across most areas are either flat or steadily increasing. The MacKenzie District continues to rise up 5.2% over the past three months and 24.7% year on year which is the highest annual rise in the country, while Southland and Invercargill are also continuing on an upward trend. Market growth remains strong in the Queenstown Lakes, as values increase 3.0% over the past three months with an average current value now much higher than the Auckland Region of $1,111,995.